So, I’ve been banging my head on this for a few days now, and still don’t have anything that works. 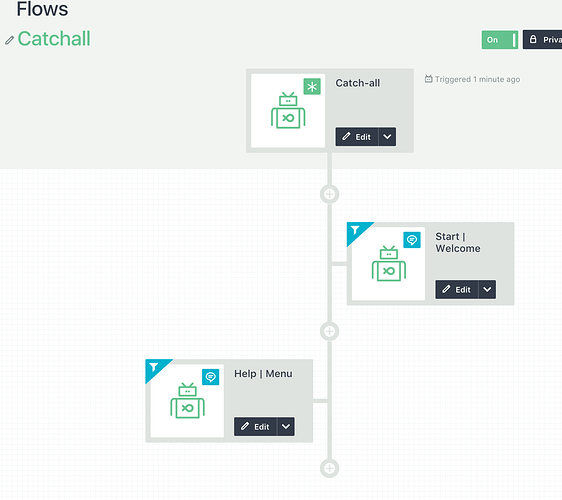 Per a suggestion from the nice folks at FlowXo support, I setup a new flow with the first item as a catch-all, and the second as the catch all message. Both my main flow and this catch-all flow listen to my single bot. Result: the catch-all message is shown before my welcome text. After that, any unrecognized messages show both the catch all message and my welcome text. I’ve since tried another approach as well: A regular message in my main flow that’s filtered to get trigged only when none of the groups defined in my start words or phrases are present. Problem with that approach is that the message doesn’t get triggered even when i send a message that does not belong to any of my defined groups. I’d really appreciate any advice you all have on this. In the bot settings, there’s a checkbox for “Show the welcome text even if a catch-all trigger is found”. It sounds like you want to have this unchecked. This should make it so the welcome text is only shown if your catch-all does not trigger. Hi Matt, thanks for the response. Yes, leaving that box unchecked means that my welcome message doesn’t display, but it doesn’t solve the main problem which is the catch-all firing at the beginning of the flow. Any idea how I would make it so it doesn’t show up as the first thing a new user sees? Gotcha. I had to set up my own catch-all to see what was going on with this. If you DO have a catch-all, it looks like you need to handle the welcome message within the catch-all. First time for a user, they get the message put in my Start action. Any other time, the catch-all bypasses that and just shows what I put in my Help action. YES! You are exactly right. Setting it up that way worked for me. Thanks so much for your help. This seems like such a common pattern, it feel like it should be more intuitive to get working. In any case, I’m super grateful for your help.